One cell. One mutation. That’s all it takes for cancer to spread throughout someone’s body. Cancer is the second leading cause of death in the United States, killing over 500,000 people each year. Nearly 40% of men and women develop cancer at some point in their life and the number of people diagnosed is rising. Thousands of scientists and doctors have dedicated their lives to finding a cure for cancer by studying immunotherapy, gene therapy, or, for one group of scientists, elephants. It all started in 1977 with Richard Peto, a professor at the University of Oxford in the United Kingdom, who theorized that large animals, with more constantly dividing cells in their bodies, would develop cancer at higher rates than smaller animals since there were more opportunities for cells to mutate. However, when he looked at the data, he found, surprisingly, that there was no correlation between the size of an animal and its cancer mortality rate. This became known as Peto’s Paradox. Here is where the elephant comes in. Elephants are over eighty times larger than humans, yet their cancer mortality rate is less than 5% compared to the human cancer mortality rate of about 22%. 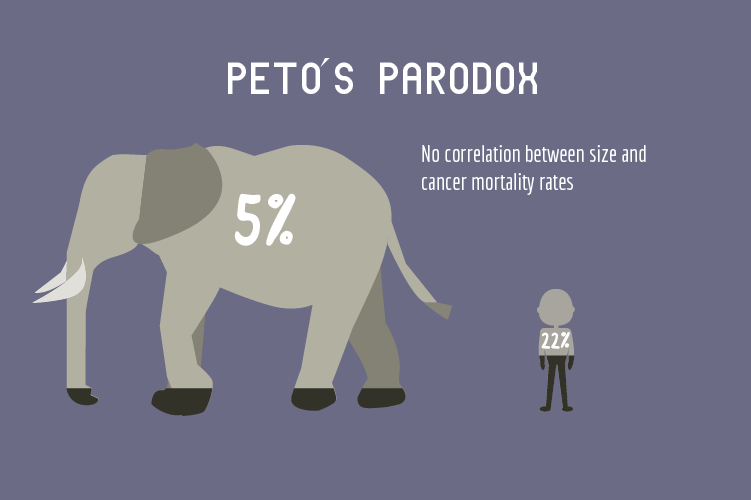 Why are large animals like elephants equally or even less likely to die from cancer than other animals? A few years ago, Dr. Carlo Maley, Dr. Joshua Schiffman, and their teams at University of California San Francisco (UCSF) and the Huntsman Cancer Institute (HCI) at the University of Utah explored this question. Dr. Maley and his team first confirmed the findings in Peto’s Paradox by examining the San Diego Zoo database that tracked the cause of death of animals in the zoo. Next, they found that across thirty-six mammalian species, the size and lifespan of the organism had no impact on their cancer mortality rate. To understand what was going on, Dr. Schiffman and his team examined blood from elephants, the largest land animals, and observed white blood cell response to DNA damage. In the experiment, human and elephant cells were exposed to ionizing radiation, which causes mutations that can lead to cancer. The study revealed that the TP53 gene was involved in the elephants’ ability to kill cancer cells before cancer killed the elephants. The p53 protein, produced by the TP53 gene, acts as a natural tumor suppressor by regulating cell division and death to reduce the risk of cancer. By examining elephant DNA, Dr. Maley and his team found that elephants carry twenty TP53 genes. In comparison, humans only have one gene made up of two copies known as alleles. The absence of even one allele increases the likelihood of getting cancer to 90%. Nature has already developed a solution for cancer. According to Dr. Lisa Abegglen, a researcher in Dr. Schiffman’s lab, elephants have evolved extra cancer-fighting genes to offset their inherently high risk of getting cancer. However, applying this knowledge to humans isn’t so simple. Dr. Abegglen explains that although the p53 protein is the “guardian of the genome” and can protect the cell by killing cancer cells, too much active p53 protein will also kill normal cells. This was clear when one extra copy of TP53 was added to mice; the mice did not get cancer, but their lifespan was significantly shorter. So how does the elephant survive with so much extra p53? The answer is that when p53 is properly regulated or controlled by the cells, cancer resistance is possible without premature aging or early death. This was proved with mouse models when the extra copy of p53 was placed under the control of a p53 promoter and cancer resistance was observed without premature aging. Although p53 protein regulation in elephants is yet to be understood, the scientists in Dr. Schiffman’s lab are well on their way to translating mechanisms of cancer resistance in elephants into effective treatments for cancer. Next time you go to the zoo and see the elephant enclosure, think about the contribution these majestic creatures have made to cancer research. After all, their genes may hold the key to a cancer-free society. Abegglen, PhD Lisa M. “Potential Mechanisms for Cancer Resistance in Elephants vs Humans.” JAMA. November 03, 2015. Accessed July & Aug. 2017. https://jamanetwork.com/journals/jama/fullarticle/2456041. “Cancer.” World Health Organization. Accessed January 21, 2018. http://www.who.int/mediacentre/factsheets/fs297/en/. “Cancer Statistics.” National Cancer Institute. March 22, 2017. Accessed June & July 2017. https://www.cancer.gov/about-cancer/understanding/statistics. “How Elephants Defend Against Cancer.” National Institutes of Health. November 02, 2015. Accessed November 06, 2017. https://www.nih.gov/news-events/nih-research-matters/how-elephants-defend-against-cancer. Karpozilos, A., and N. Pavlidis. “The treatment of cancer in Greek antiquity.” European journal of cancer (Oxford, England : 1990). September 2004. Accessed December 26, 2017. https://www.ncbi.nlm.nih.gov/pubmed/15341975. “TP53 gene – Genetics Home Reference.” U.S. National Library of Medicine. Accessed November 06, 2017. https://ghr.nlm.nih.gov/gene/TP53. My name is Macafie Bobo and I am a student at Winston Churchill High School (MD). During my first year in Curious Science Writers, I have not only expanded my understanding of science, but I have also grown as a writer and as a person. My goal is to contribute to society by informing people about scientific topics that they may not yet know about. In my free time, I enjoy drawing, writing, and playing sports. Expressing myself through both science and writing is something that I hope to continue doing in the future. Very clearly written, extremely interesting information, and I congratulate the young writer for unearthing this information and making it available. I also think that elephants are more intelligent in many respects than humans and would love to know if there are scientific reasons why that is so. Great job on the graphics! I love how they look super cute yet professional at the same time. Really interesting topic. Your article was very easy to read and understand. Very well written article, Macafie! Your explanation of tricky scientific topics was easy to understand and follow 🙂 The graphics are amazing as well, kudos to the graphics team!